Fabulous Affordable Family Home! 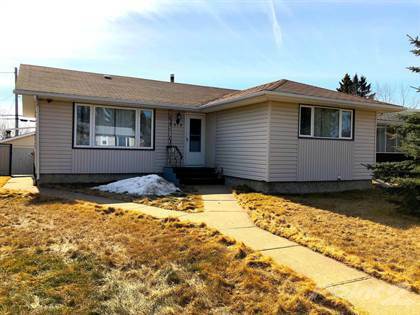 Located on a quiet friendly residential street this well maintained 3 bedroom bungalow has the Bigger Upgrades taken care of, Shingles are good for another 8-10 yrs. Furnace and Windows 2012, Hot water Tank 2018, original Hardwood Floors in Living, Dining, Hall & Master are in good condition. Recently painted, newer front load washer/dryer, Original 1960's Wet Bar & Shuffleboard completes the vintage look of the basement. Rear entrance, Insulated 20x20 garage, Patio, Vegetable Garden & Huge Secure Shed offers plenty of room for Garden equipment, Tires & Bikes. Located close to Public & Catholic Schools, Playgrounds, Parks & Shopping you could be enjoying this summers' BBQ's watching the Veggies Grow! Hi, I'd like to find out more information about 5919 141 Avenue. Thanks so much!